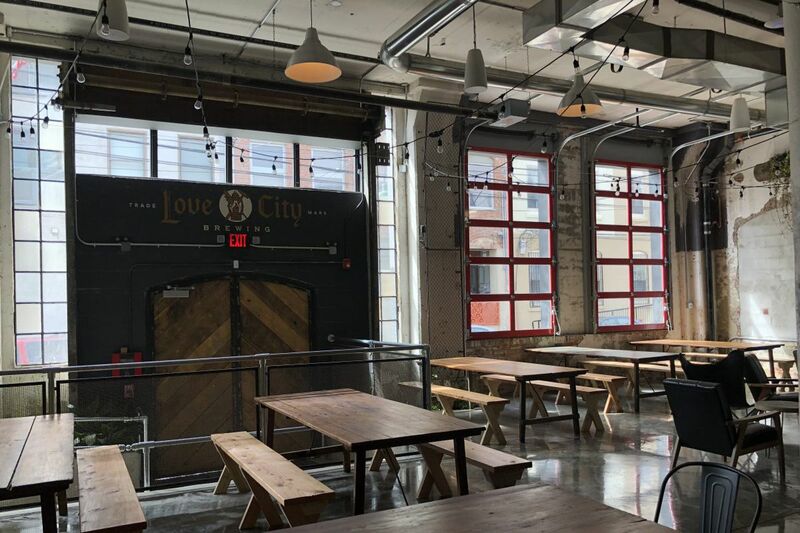 Love City Brewing, 1023 Hamilton St. , is due to open this month. French, Italian, Peruvian, cideries, outdoor experiences. A new restaurant at the Bok Building in South Philadelphia for you lovers of peak views. And speaking of peaks: How about more Nepalese cuisine? A look at my list of pending bar and restaurant projects shows more than three dozen scheduled openings in the Philadelphia region in the next 75 days or so. Opening dates are elusive — delays are reflected in financial, permitting, and construction issues, and in some cases staffing woes and (yes) owners' irrational optimism. This is only a tip of the scene, at that. Chalaco's, a Peruvian restaurant-lounge specializing in pisco cocktails and ceviche and other seafood at 1030 N. Second St. (Liberties Walk) in Northern Liberties, has set April 18 as the premiere. Owners are from the Baltimore area. Love City Brewing, 1023 Hamilton St.
Ardiente, a flashy Latin/Asian hybrid at 33 S. Second St. in Old City, is undergoing its final tweaks for a late-April opening. Ardiente, 33 S. Second St., will mix Latin and Asian cuisine. Old City also will have Glory Beer Bar, run by alums of the now-shuttered Eulogy, at 126 Chestnut St., where Mad River was. Ardmore is expected to get two newcomers in the next two weeks: Ripplewood Whiskey & Craft will be what's billed as a two-story "throwback Americana gastro-bar" at 29 E. Lancaster Ave. The Bercy, a luxe French destination at the former Primavera Pizza Kitchen (7 E. Lancaster Ave.), could become the Parc of the Main Line. A bar under construction at the Bercy in Ardmore. J. Alexander, a steak/seafood chain out of Nashville, is targeting April 30 at 265 Mall Blvd., on the outskirts of King of Prussia Mall, adding yet another higher-end dining option to a crowded market. Due by April's end is Burrata, an Italian BYOB at 13th and Wharton Streets, replacing August. Cider houses will rule this spring. I hear May for the openings of both Hale & True (613 S. Seventh St., Bella Vista) and Kurant Cider (436 E. Girard Ave., Fishtown). Attico, a rooftop restaurant/lounge at the new Cambria Hotel, 219 S. Broad St., near Locust. Del Frisco's Grille is expected to open on the Cambria's ground floor this fall. Brickwall Tavern, backing up to sibling restaurant Porta (1214 Chestnut St.) but with an entrance on Sansom Street across from Fergie's Bar, is targeting May 4. ElMerkury, a Central American street-food specialist, will be at 2104 Chestnut St., replacing Agno Grill. Koreana, a casual Korean fast-casual now in University City, is planning a branch at 37 S. 19th St., replacing MilkHouse. Main & Vine, a California-theme bistro replacing Avenue Kitchen at 789 E. Lancaster Ave. in Villanova, is expected to open before Mother's Day. Harper's Garden, a wine garden set beneath a pergola, is looking at spring at 31 S. 18th St., placing it near nightspots, including Continental Mid-town, Concourse Dance Bar, and Uptown Beer Garden. TALK, the new-American spinoff of West Philadelphia's Marigold Kitchen, should open in May at 2121 Walnut St.
L'Anima, an Italian BYOB from the Melograno crew at 17th and Carpenter Streets in South Philadelphia, is looking at May. Cafe Lift, the bruncherie, has a late May/early June target for its first suburban location, 724 Montgomery Ave. in Narberth. Louie-Louie, a Euro bistro from the White Dog Cafe crew, is setting up at the Inn at Penn (36th and Walnut Streets). The South Philadelphia branch of SOMO in Manayunk — the keyboard-busting SOMO SoPhi — is looking at May at 13th Street and Packer Avenue. Pineville Tavern expects to open its Port Richmond branch at 2448 E. Huntington St. (off Aramingo Avenue) in mid-May. Sarvida, a second restaurant from Perla's Lou Boquita, is expected in late May at 300 E. Girard Ave. in Fishtown. "End of spring" is the target for Spice Finch, the Mediterranean bistro from chef Jennifer Carroll at the Warwick Hotel (220 S. 17th St.). "Right after Memorial Day" is what management suggests for Nunu (1414 Frankford Ave.), the Japanese bar next to Cheu Fishtown. Tradesman's, a barbecue themer from the Bru/U-Bahn/Uptown Beer Garden crew, is looking at early June at Juniper and Chestnut Streets. The view from Irwin’s, coming to the eighth floor of Bok. Irwin's, a Mediterranean/Middle Eastern small-plater/lounge, is looking at late spring on the eighth floor of the Bok Building at Ninth and Mifflin Streets in South Philadelphia. It will be on the same floor as the popular Bok Bar, which returns for the rooftop season on or about May 24. Roxborough, meanwhile, is several months from the debut of White Yak (6118 Ridge Ave.), which likely will be the city's first Nepalese restaurant. Figures that this is the highest point in the city. You don't need a sherpa to find the region's other Nepalese restaurant: the new Mount Masala in Voorhees. "Summer" is the word for the Center City location of the New York bar P.J. Clarke's, which announced its deal for the Curtis Center (Sixth and Walnut Streets) in early 2016. Bourse Marketplace will assemble dozens of food stalls at the Bourse, on Fifth Street south of Market Street, by midsummer. Giuseppe & Sons, an Italian concept from the Termini baking family and Michael Schulson, is up for summer next to Harp & Crown on the 1500 block of Sansom Street. Aether, a Fishtown outpost of Princeton/KoP's Mistral and Elements, is looking at summer at 1832 Frankford Ave.
Pizzeria Beddia, whose recent closing on Girard Avenue wound up as front-page news, has secured a location on Lee Street near Front Street; its opening as a sitdowner with bar is projected for fall. Jean-Georges Vongerichten's and Greg Vernick's restaurants at the new Comcast Technology Center are not supposed to open before fall. Keep up with the openings at www.philly.com/mike.